Any perfume house worth its extrait is now adding home fragrances to its range, enabling perfume-lovers to infuse their homes with the same scent they spritz behind their ears. As early as the 19th century, Guerlain offered numerous scents for the home. 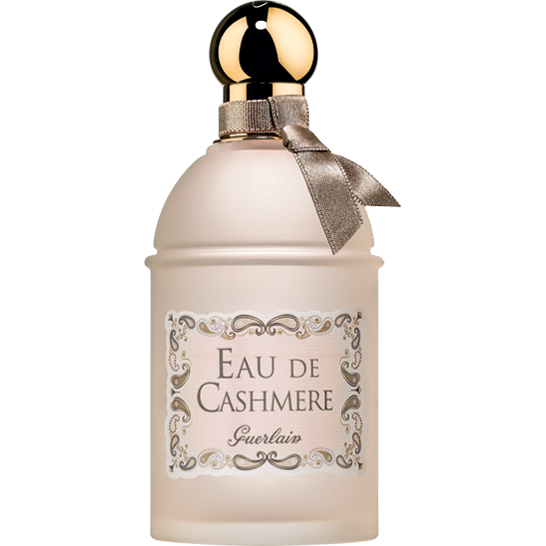 Many people may not know that Guerlain has currently has a home fragrance range including: room sprays, candles, incense sticks and soaps. They are only available from their flagship store on the Champs-Elysées in Paris, usually only sold in their boutique and some are even given away for gifts with purchase or to special VIP clients. 180g (6.4oz) candles retailing at $95 each. Bois des Indes (Indian Woods): it's spiced woods scent recalls an intense journey to the sacred heart of India. Another place that transports you into the cool air of an agreement of crushed leaves revived by the sparkle fruity rhubarb. The mild sweetness of sandalwood weaves jasmine petals on a bed of vanilla. Fleurs Des Iles (Island Flowers): based on the Aqua Allegoria scent Lys Soleia.Top notes: bergamot, lemon and palm leaves. Heart: lily, ylang-ylang, and tropical fruits. Base: tuberose, vanilla and white musk. Boudoir Vénitien (Venetian Boudoir): its powdery floral scent imagines an intimate moment in Italy.Venetian Boudoir is a tribute to the warm interior and baroque. The intimacy of a cozy alcove nimbus of a tender and sweet scent that starts on blackcurrant. The Parma violet then whispers its secrets to the rich leather of Cordova, in a cloud of scent of rice powder. Forêt de Sumatra (Sumatran Forest): its exotic woody scent is inspired by the imaginary scenery of the Indonesian forest, with notes of moss, jasmine, ylang-ylang, smoked tea, vanilla, benzoin, tonka bean and patchouli. 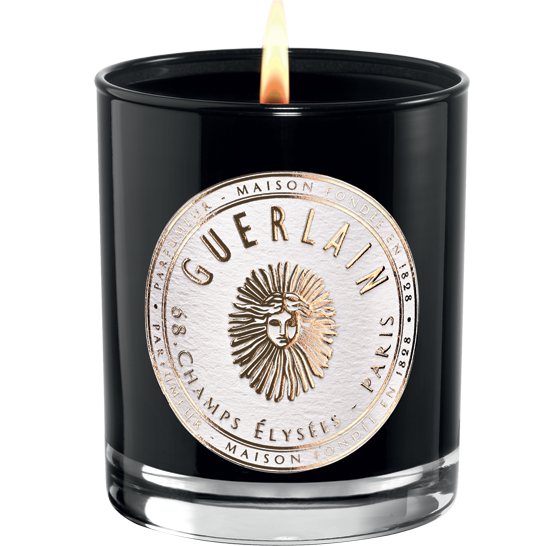 On the occasion of its launch, the design of the entire candle collection has been changed into a heavier, shiny glass jar bearing Guerlain's revived Sun King symbol. c2013. Pot Pourri Parisien: (Parisian Potpourri): A stroll through the heart of the French capital, an encounter on the banks of the Seine, a stolen kiss… A bouquet of aromas with enchanting lingering notes. Paris, the city of temptations, where the sweet smell of cinnamon flirts with patchouli and sandalwood. A potpourri of scents, like a vague memory of yesteryear. Audacious Paris. Romantic Paris. Paris, I love you. Oriental, Aromatic. An olfactory reference to Jicky. Notes of orange, petit grain, neroli, mint, rosemary, marjoram, cinnamon, geranium, patchouli, sandalwood, benzoin. c2013. Pluie De Petales (Mist of Petals): the fragrance is inspired by the perfume Idylle. Hiver en Russie (Russian Winter): its woodsy oriental fragrance recalls shivering at the sumptuous frosty Slavic palace . Contrast between the warmth of golden domes and snow white ... It gets inside and discovers a mystical fragrance from precious woods and incense. Gradually, the warm amber reassurance and shuddered at the touch of clove exploding overwhelming sensuality. Recollecting the pleasure of dazzling palaces and the luxuriousness of Russia under the Tsars. The perfumed tea of a samovar gets together with the smell of wax. The precious ashes enriched with myrrh illustrate the gold churches' mystic splendor. Contes Tahitiens (Tahitian Fairy-Tales): its friuty and solar scent recalls the exotic scents of the islands ... Reminiscent of lush shores where time languished, Tales Tahitians breathes like a whirlwind of sunflowers sweet tiare of fresh guava, which capsized on the creamy sweetness of sandalwood Marquesas and sensuality of vanilla Raiatea. Route de la Soie (The Silk Road): Inspired by the fragrance of Guerlain's Samsara perfume. Orchidee Imperiale: Contains the signature scent of the Orchidee Imperiale skincare line..
Un Instant au Soleil (A Moment in the Sun): a soapy floral, I do not have the notes on this or which Guerlain perfume inspired it, it may be a reference to the Terracotta line or AA Bouquet No.1 or AA Jasminora or L'Instant perfume. Le Temps Des Lilas (Lilac Time): a lilac soliflore candle from the early 1980s. Found on an empty candle holder with label on base, "LE TEMPS DES LILAS Guerlain Scented Candle 175 grams Copyright 1983." Referenced in Le Figaro magazine, 1985. Fougeres (Ferns): a fern (fougere) candle from the early 1980s, also known as Fougere No.5. Referenced in Le Figaro magazine, 1985. 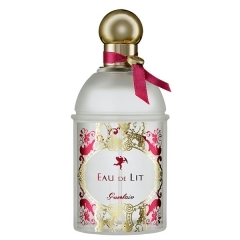 "Guerlain reinvents one of the most delicate traditions with Eau de Lit. Its ritual unfolds like a love story. When night falls, the mischievous and sensual Guerlain woman perfumes her sheets with Eau de Lit. As if by enchantment, her nights are bathed in a cosy, glamorous atmosphere, ideal for games of seduction. The bottle is adorned with a label, like pink and gold lace, and a pink ribbon around the neck. When you travel, slip it into your suitcase to recreate your little haven of pleasure in your hotel room with this very soothing fragrance." A fragrance that you can spray onto your bedding. Could also be used as a room spray. 30ml. It is classified as a fresh, musky floral fragrance. 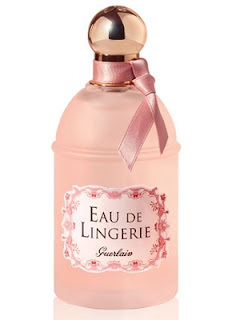 "The skin is kissed by fragrance and caressed by lingerie, which is given a new beauty step by Guerlain. A new delicate fragrance to spray on underthings, like an invitation to an unprecedented moment of sensuality. An original embrace to perfume your most chic undergarments and set the senses awhirl. An invitation to voluptuousness… An ideal gift for someone special or yourself! Spray Eau de Lingerie on the dainty satin of a nightie, on the bow adorning the strap of a bra or on the lace of a negligee. Or spray a light mist in your lingerie drawers. This new beauty ritual harmonises with all fragrances." It is classified as a musky floral fragrance for women. It contains notes of iris, rose, vanilla, sandalwood, white musk and ambrette. A fragrance you can spray onto your lingerie. Could also be used as a room spray or sprayed onto your bedding. 125ml. "A unisex fragrance to spray directly on your favourite jumper or scarf, for the ultimate touch of elegance. Perfumers reveal their latest secret to scenting your favourite items of clothing. This original and unique way of applying perfume can be used with any scent from the l'Art & la Matière collection, for an irresistibly elegant fragrant trail. L'Eau de Cashmere is a new ritual created to enhance your signature scent. Designed to be worn with any of the fragrances from the Art & Matière collection, it gives a twist to your perfume, adding a gentle, woody note that is both enveloping and reassuring. A perfumer’s secret reserved for those in the know, offering a unique fragrant trail." A unisex fragrance created for you to spray directly on your favorite sweaters and cashmere stoles for a cocooning effect of the smartest kind. 125ml. Eau de Toilette. Smells just like the Meteorites makeup. Comes in a 125ml/4.2oz bottle. L.O.V.E. Orchidée Imperiale. Guerlain, please ALWAYS keep that fragrance in your skin care line. It's luxurious and relaxing all at once. To me, sublime!